The news hardly comes as a surprise. On Tuesday, Greek Finance Minister Yanis Varoufakis told journalists that Athens would not make the IMF debt payment on time. Skipping a payment to the IMF is referred to as arrears in the fund's terminology. It should be officially confirmed by IMF chief Christine Lagarde, who in a month should notify the fund's executive board. In fact, this could be classified as a default, like any other failure to pay debts on time. This could trigger a cross-default on Greece's multibillion-dollar commitments to the European Financial Stability Fund (EFSF). The IMF cannot issue new loans to a country that is in arrears. The question now is what’s next for the country’s financial system, the people and its membership of the Eurozone. On Tuesday, Greece asked the European Stability Mechanism (ESM), which includes all of the 19 Eurozone members, for a new bailout to cover the country’s financial needs for the next two years. The request included a restructuring plan for Greece’s debt to the European Financial Stability Facility (EFSF), which accounts for about 63 percent of the country’s total debt. The Eurogroup refused to extend the bailout program to Greece, and rejected Greek Prime Minister Alexis Tsipras’ latest request for a new bailout, Finnish Finance Minister Alexander Stubb said Tuesday. However, the Eurogroup, consisting of Eurozone finance ministers, is to discuss new proposals from the Greek government Wednesday. German Chancellor Angela Merkel said Tuesday that her country will not consider a third bailout for Greece before the July 5 referendum in Greece takes place, various media outlets have reported. On June 5, Greece invoked a 1970s IMF rule that allowed it to bundle all of its €1.6 billion payments due June into one, thus avoiding immediate default. However, it failed to pay even under these conditions. Greece is also due to pay €6.6 billion to the ECB in July and August. The ECB has already turned down Greece's request to expand the €89 billion emergency liquidity assistance (ELA) to Greece by an additional €6 billion to tackle deposit flight. This resulted in the closure of most Greek banks for a week and putting a limit on ATM withdrawals to €60 a day. The country also has to make payments to private creditors, including €2 billion in Greek Treasury bills that are due on July 10. 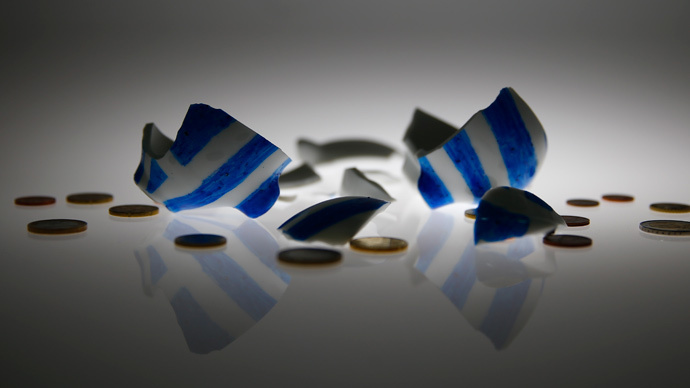 If they fail to do that,the ratings agency Standard & Poor’s said it would designate Greece as being in default. Greece's radical left Syriza government, led by Prime Minister Alexis Tsipras, came to power aiming to end austerity measures, and has repeatedly said its goal is to stay within the euro. On Saturday, the government announced a national referendum on the creditors’ offer to the country. Even if the referendum is not on Greece leaving the Eurozone, many leading European politicians have said that a “No” answer would be equivalent to a refusal to stay within the European Union. Voting “No” would mean a suicide for Greece, European Commission President Jean-Claude Juncker said Monday. However, German Finance Minister Wolfgang Schaeuble said Tuesday that Greece could maintain its membership in the Eurozone even if the nation votes against austerity reforms this Sunday.